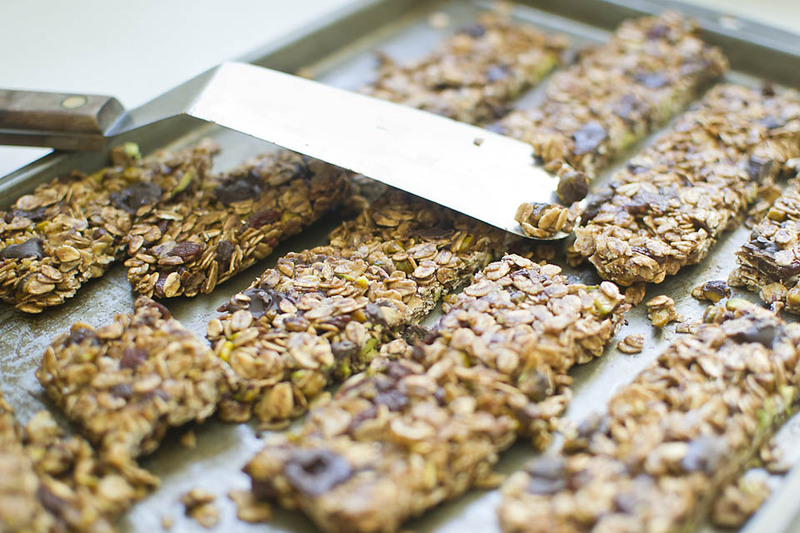 Granola bars can be a fantastic recovery snack, but not all bars are created equal. Many of the granola bars found at the grocery store are packed with sugar and unnecessary additives, so why not make your own? We used honey and maple syrup to sweeten these Chewy Goji Berry and Chocolate Granola Bars naturally, and just added some chocolate chips to give them that extra "oomph"! 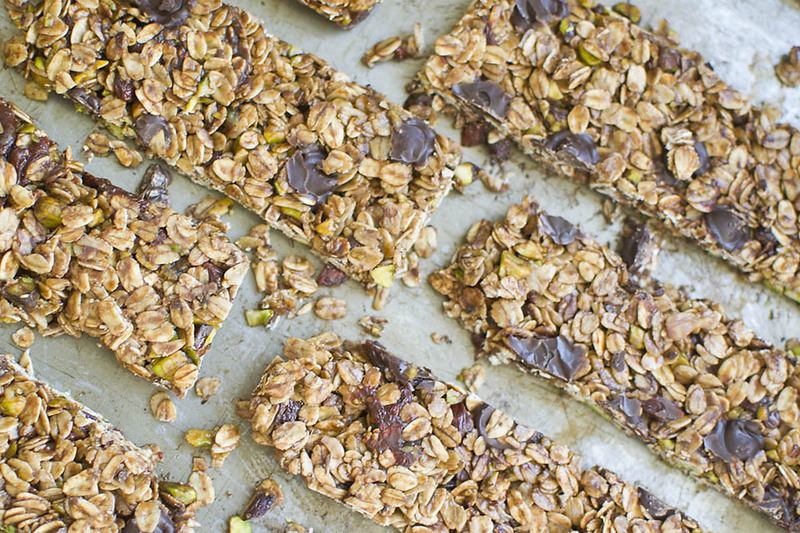 If you've tried to make granola bars before and ended up with granola instead, don't fret. These bars really do stick together, as long as you press down the granola mixture long enough before refrigerating. Really, homemade granola bars really don't come much easier and yummier than this! Heat the oven to 175C. Line a 20 cm x 20 cm pan with aluminium foil and oil it lightly with Organic Love Coconut Oil. In a different pan, toast the oats and Pistachios, Please in the oven for 5 minutes, then stir and bake for another 5 minutes or until lightly toasted. Transfer to a large bowl. Melt the butter and honey in a small saucepan and add maple syrup and vanilla extract. Stir occasionally until everything is mixed. Pour the butter mixture in the bowl with the toasted oats and pistachios and mix well. Let the mixture cool off for about 5 minutes, then add the Go Goji Berries and 0.5 dl of the chocolate chips. The chocolate will melt a little bit and this is just fine. 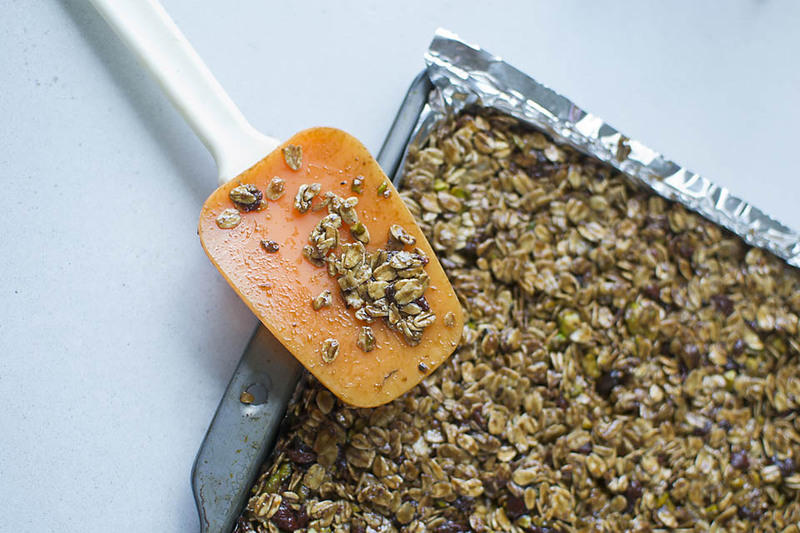 Firmly press the granola bar mixture into the foil-lined pan with your fingers or a spatula - the longer and harder you press, the better the bars will hold together when you cut them. Sprinkle the remaining 2 TBS of chocolate chips over the mixture in the pan and press them into the mixture. Cover and refrigerate for at least 2 hours. Lift the aluminium foil with the granola bar mixture out of the pan and turn it upside down. Peel off the foil and cut into 12 bars. The thicker and shorter the bars, the better they hold together.